The battalion was activated on May 1, 1943 at Camp Lejune, North Carolina. It relocated during August 1943 to Camp Pendleton, California and was assigned to the 4th Marine Division. During World War II it participated in the Battles of Kwajalein, Saipan, Tinian and Iwo Jima. 1/14 redeployed in October 1945 to Camp Pendleton and was deactivated on November 15 of the same year. The battalion was reactivated on February 1, 1966 at Treasure Island, San Francisco, California, as Headquarters Battery, 14th Marines and assigned to the 4th Marine Division, Fleet Marine Force, Marine Forces Reserve. It was redesignated February 1, 1967 as Headquarters Battery, 3rd Field Artillery Group, Force Troops. It was redesignated again on September 1, 1979 as Headquarters Battery, 5th Battalion, 14th Marines and finally on October 1, 1985 as 1st Battalion, 14th Marines. 1/14 was mobilized during January 1991 in support of Operation Desert Storm and deployed to MCB Camp Lejeune, North Carolina. It demobilized during June 1991 and returned to Treasure Island. It was relocated during February 1992 to Alameda. 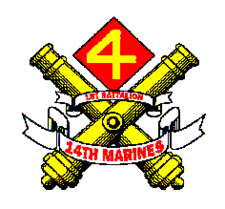 1st Battalion, 14th Marines was deactivated on March 24, 2007 and redesignated the 4th Force Reconnaissance Headquarters.